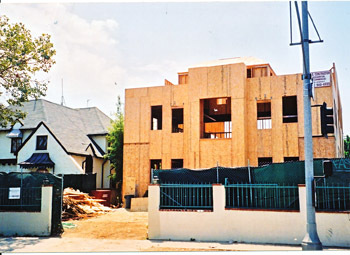 CONGREGATION leaders tore down the existing house and started construction on the 8,100 square foot structure in 2002. A recent city settlement with a Jewish Orthodox congregation at Third St. and Highland Ave. was a bad one, said area resident and attorney Michael Wright. Under the agreement, the city agreed to pay Etz Chaim Congregation $950,000 in court fees ending a years-long legal battle. “I am glad that we were able to come to an agreement and put 17 years of litigation behind us,” said Councilman Paul Koretz. The decision was political, added Wright, who had represented the homeowner who lived next door to the temple in an earlier lawsuit. “I think the city’s decision is bad for Hancock Park and every other residential neighborhood where religious groups seek to move in and establish non-residential uses. It’s very important for our zoning laws to maintain residential uses,” said Wright. The case was set to go to the U.S. Ninth Circuit Court of Appeals, which favors the city in this case regarding the Religious Land Use and Institutionalized Persons Act (RLUIPA). “RLUPA is an unsettled area of law and federal courts of appeal are divided on it. The Ninth Circuit is more favorable,” Wright explained. Congregation leaders first applied for a zoning variance in 1996, which the city denied claiming a synagogue would generate traffic and was out of character with neighborhood’s “stately” homes. Etz Chaim filed a lawsuit after a second permit was denied, claiming federal law prohibits land-use regulations on exercises of religion. The Congregation demolished a 70-year-old, 3,000 square-foot home on the Third St. site in 2002, and built the 8,100-square foot temple in the residential area. The Congregation sued the city in 2010, challenging its denial of a conditional use permit to use the home as a temple. In 2011, U.S. District Judge Christina A. Snyder ruled in favor of the synagogue. In May, Snyder issued an injunction allowing the home to operate as a synagogue, with restrictions on events and numbers of cars parked on nearby streets. A city Claims Board recommended the council approve the pact prior to the settlement. An area resident, who asked to remain anonymous, said he was “mystified” with the recent settlement. The city’s decision posts a green light for other orthodox groups to move into a residential zone, such as already taking place in North Hollywood and Brentwood, the resident added. Etz Chaim attorneys Joseph Fischbach and Kathryn Davis did not return calls.